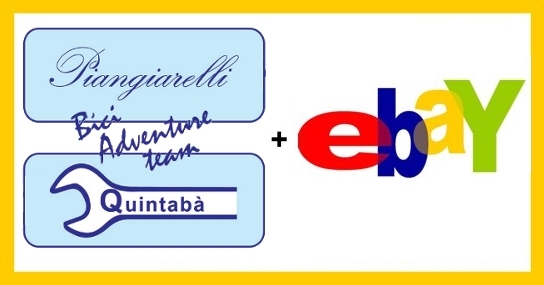 Welcome to PIANGIARELLI & QUINTABA' - Ricambi auto, ricambi moto, bici e attrezzature! When choosing the suppliers with which to operate we pay particular attention to the quality of spare parts provided that always responds to The legislation of "equivalent" replacement is a spare recognised by the parent with the same requirements as the original and therefore suitable for repairs made on cars still under warranty. There are original spare parts Fiat Alfa and Lancia spare parts equivalent of primary brands such as Bosch, Brembo, Champion, Skf, Rhiag, Ngk, Valeo, Ferodo, Castrol and equivalent parts for Eastern cars : Japan Parts and Ashika. » Browse categories shown on the left and searches. Our name is a guarantee for buyers having more than 11000 FEEDBACK positive. Copyright © 2019 PIANGIARELLI & QUINTABA' - Ricambi auto, ricambi moto, bici e attrezzature VAT n.: 01093010435 REA number: MC-115635 Equity: 118.000 euro i.v.